Parents are often confused by the ACT and SAT college admission test. Explained here is what the tests are, when and how often students should take the tests and what a good score is. By the end of this article, you will be informed and be able to better prepare your child for the ACT and SAT college admission test. What is the ACT and SAT college admission test? The tests are two different tests that are required on college admissions applications. The student will not be able to get into college without a score from at least one of these two tests. The SAT test emphasizes problem solving and reasoning. It tests math, writing and reading. The ACT test is based upon the high school curriculum including math, English, science and reading. The essay portion is not required on the ACT test but it is offered as optional. Even though the SAT or ACT is preferred in different places, all states offer both. 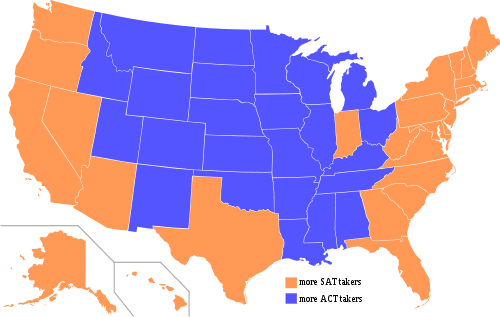 According to the preference map, 24 states prefer the ACT, while slightly more, 26, prefer the SAT, 3 August 2007, source : http://en.wikipedia.org/wiki/SAT_test. When should my child take the exams?
) and establish a daily study plan. Be sure that the student is spending enough time studying the math basics. What a good score is depends upon what the student’s school of choice is. What is considered a good score for one school may not be a good score for an Ivy League school, for example. It is important to find out what is the average score of the students admitted to the college your child wants to attend. Generally, the average ACT score is 21 so anything above that would be an above average score. For SAT scores, regular colleges usually require over 1,500 and Ivy League schools require over 2,000. If your child is satisfied with the score as being representative of his best performance, then that is a good score. If the student is dissatisfied, set up a plan of study and take the test again. These are some explanations of the two college admission tests. It is a good idea for parents to know what the tests are, when the child should take them and what a desirable score is. Now that you have this information, buy some study guides; help your child establish a study plan and he will be on the right path to success in getting into the college of his choice.